The Fisher Scientific Isotemp Explosion Proof Refrigerator Freezer gives your lab ample storage and peace of mind working in Class 1, Division Group C and D hazardous locations and explosive areas. This large capacity lab refrigerator must be hard wired into an appropriate conduit, but doing so prevents sparking and accidental disconnection. The Isotemp 13-986-525D has a temperature range of -15 to 4°C for the freezer section and a 3° to 13°C and uses CFC free refrigerant, controlled by the static hot-wall condenser and evaporator that is free of electrical fans. Nestled inside this 30 Cu Ft capacity explosion proof refrigerator is a 5ft cu ft freezer space. The Fisher Scientific Isotemp Explosion Proof Refrigerator Freezer further prevents sparks with an isolated, vapor free, top mounted, enclosed thermostat and a magnetic vinyl door gasket to keep hazardous fumes from escaping. The solid door may be locked with a plastic key for added security. 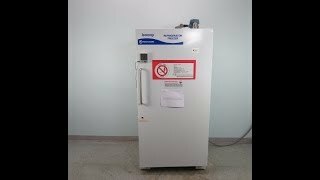 This Fisher Scientific Isotemp Explosion Proof Refrigerator Freezer has been tested and performed to expectations. Note there are two cosmetic issues, one dent at the top of the door, and paint spatter inside the unit, these however do not impact performance. Also of note, the picutred thermometer is not included. All of our lab equipment comes backed with our standard warranty. Should you have any questions, please don't hesitate to contact us.